Have you ever shared about your family on your blog? Do you feel like adding a story about your own life is too personal? This particular topic has been on my mind for weeks now, and I’m really excited to have this conversation with you. 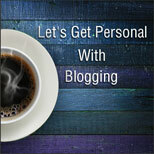 Today, let’s talk about getting personal with our blogging. Social media is a wonderful thing. I never thought it would be so easy to keep in touch with old friends. I love seeing updates from my girlfriend who lives in Germany. Social Media has brought us together. Yet, at the same time it has created distance. Have you ever see that commercial where the daughter is worried about her parents and their “anti-social behavior”. She admits that they (her parents) only have 16 Facebook friends, and she on the other hand has over 600 friends. Meanwhile, the commercial is cutting to her parents with another couple going out, bike riding, and going to concerts. Social media does lack a personal touch. Because of that, readers crave authentic vulnerability that can be difficult to communicate though writing. However, I believe that adding a personal touch to every post is vital in this increasing social media world. There are a few risks that come from adding that personal touch. First, once you put your information out there – it’s out there for everyone to see. I’m a shy person by nature and it makes me nervous that what I say today will always follow me. Video Blogs, which is a whole beast in and of itself. But, they are a great way to get personal. I did one not too long ago. I had just cut my hair and now it’s on YouTube! Knowing those risks and I’m sure there are many other risks, how do we communicate that we are real people on the other side of the computer? You may have heard me describe it this way. Every blog I write, I want my reader to feel like we just had a great cup of coffee at the local coffee shop. Notice, it’s not at my home, where you will see the dishes in my sink, or my daughters trail of toys from her bedroom to mine. As great of a picture that is, how do we do that? Offer your reader little pieces of who you are. So add a quick story here or a funny story there. Only offer what you’re comfortable with and be as honest as you can.Example: One of my blogs that I write for the owner is a big Detroit sports fan. I try to add it a little bit about whatever is happening with the Tigers, Lions and Redwings. Besides having a bad hair day, I loved doing a video blog. It is personal and doesn’t hide the amazing content you are sharing. These are good for blog posts in general. I’ll admit, I haven’t actually done this and I’m changing that today. Adding pictures provides a personal touch. All three blogging tips suggestions offer that personal touch while keeping things professional. Do you agree that blog articles need a personal touch? How do you keep it personal? 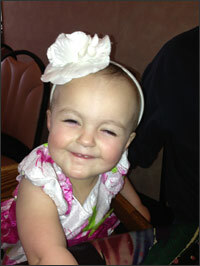 Here are some pictures of my little lady this weekend. 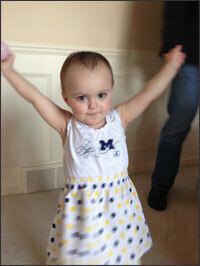 She was celebrating the Wolverines making it to the final four and partying in her Easter dress. Have a great week! But, this is making me rethink. Maybe I’m not being personal enough. Great job. I feel adding personal information in an appropriate manner in a blog article helps the reader connect with the writer on a human level. I completely agree! Thanks for commenting! I do think a personal touch is good, now and then. I’m not too good at it myself, but I think about it and do my best to have my own style and convey my way of thinking. Working on getting “me” more into the posts though. Your unique writing style offeres a bit of yourself and can be personal. Thanks so much for commenting. That’s an interesting question Christine. I think I ‘keep it personal’ through my writing style. I try to write the way I’d talk to you in person, so there’s less distance between myself and my reader. When I blog ‘how to’ posts (which I do fairly often) I share the ‘I feel your pain’ reason that got me to search for a solution. My goal is always to empower. The name of my company is Yes You Can, so my message tends to flow in that direction. It helps me connect with my audience in a very personal way, based on what they’ve told me 🙂 Great post. Your daughter is adorable! Thanks you so much, I think she is adorable too and I’m completely in love with her. I love your take on making it personal. You do it in an inspiring way. Thank you so much for sharing! I can understand the hesitancy – it’s a big world out there, and once you publish something, it’s there forever! However, to do social media right, you have to make it personal and that includes sharing bits of yourself. I like the idea of a video blog…I plan to get there once I decide which video camera to go with! You are so right, Carrie, I couldn’t have said it better. I would love to hear about how your experience with video blogging goes. Video blogs are such a great way to be personal and stay professional. I love it. Thanks so much for commenting. My blog started as a way to communicate with message boards friends. They were friends first, followers later so I kept it “friendly”. The choice on what to post and what not to post is a twist on what my father taught me about talking “never say anything about anyone that you wouldn´t dare repeating to their faces”. 😀 If I´d feel umcomfortable with it later I don´t post it. That being said it is a “lifestyle” type of blog. If it were a “product” type I´d keep it focused on the product and it´s benefits with little to none personal content. Sounds like your father is a wise man! I agree that there is a difference between “lifestyle” blogs and “product” blogs when being personal. Thank you so much for commenting. Great post. I am new to blogging and my blog focuses on crafts and scrapbooking. Which appeals to relationships so I feel I need to talk to them as we are already acquaintances if not friends. But I am still careful about what I share about my personal life. It is so important to only post personal information that you are ok with the whole world knowing. I think you are right on when writing as though your readers are already your friends. Thanks so much for sharing. I’m with you 100%. Seems to me that the whole point of all this social media is to establish person-to-person connections. Otherwise we’re writing in a secret diary or talking to the trees. Posting on Facebook, Twitter, and all the rest — especially blogging — invites that personal engagement. Particularly when we write in our own “voice” and reveal that we’re people with hopes, passions, strengths, and weaknesses. Like many bloggers, I suppose, I write most often about my businesses, and usually from a personal perspective. Occasionally I write mainly about my own thoughts and feelings. But always in the hope that people will find it interesting enough to reply, and make it a conversation. Thanks so much for sharing. I love what you said about how writing from your own voice can add that personal touch. I agree that sharing something personal from time to time is a great idea and brings some life to your blog and show you are human. I am not in favour of sharing personal experiences all the time though, unless your blog is about that. Thank you for commenting. I agree with you about how you don’t want to overshare. That’s where the idea of having coffee at a coffee shop and not your home came from. A little can go a long way. I love a blog that has a good balance between business and personal stuff – there is nothing that will turn me away from reading more that SELL SELL SELL. Time to write an “About Me” blog I think! I’m with you, when a blog is all “SELL SELL SELL”, I stop reading. 😉 I would love to read your “about me” blog when you post it, so keep me updated! Thank you for sharing. I had my personal life and my business life so far apart I didn’t know who I was. I started sharing a little bit more about myself about a year ago and it makes a big difference! Great advice! I can see how you felt like you didn’t know who you were by keeping two huge parts of your life so separate. Thanks so much for sharing! I blogged about me Christine! Excellent post! I think it is a great idea for sharing a few personal details. With so much networking and business happening all online these days, you might work with a lot of people that you never meet in person. But you want to work with people you trust, right? Sharing a bit of personal details is one way to open up a bit and build that trust. Well of course I had to go read this letter. I must say, very romantic. I love that poem too. That article is another great example of getting personal with your readers. Thank you so much for sharing.